The ancient Sumerian cylinder seals are considered without a doubt some of the most interesting objects ever recovered from Ancient Mesopotamia. A cylindrical seal is a small object decorated with images, words, or in some cases both, engraved on its surface in an intricate way. A cylindrical seal is a small object decorated with images, words, or in some cases both, engraved on its surface in an intricate way. Cylinder seals are important to scholars since they often tell a story about a specific timeline and civilization. The ancient Sumerian cylinder seals have left a true mark on history. 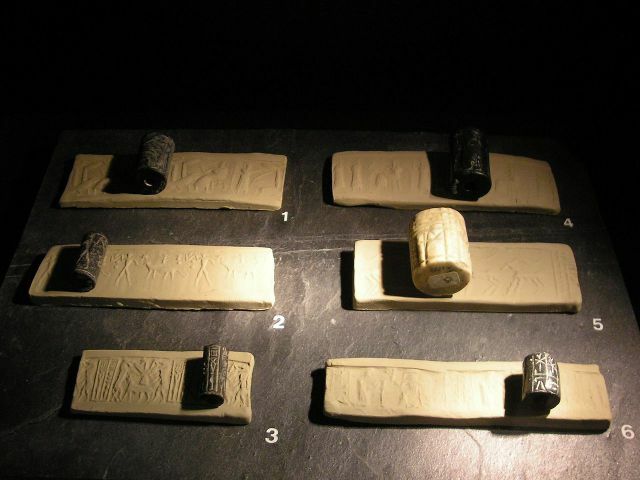 Ancient Sumerian cylindrical seals were applied by rolling them onto fresh clay, which left behind the impression. When the clay dried, the image was reflected on its surface. These stamps were used in ancient Sumer for a variety of purposes, including commercial transactions, decoration, and correspondence. The Cylinder seal was considered as an extremely important part of daily life in Ancient Mesopotamia. Cylinder seals were known as kishib in Sumerian and kunukku in Akkadian and were used by everyone, from royals to slaves. The images left behind by the seals on clay surfaces were quite complex and beautiful. Cylindrical seals were used by cultures from the ancient Near East, including the Sumerians, Akkadians, Hittites, and Persians. According to experts, these intricate objects originated in the Late Neolithic Period, sometime around 7600-6000 BCE, in modern day Syria. There are some scholars who argue that cylinder seals originated in Sumer, modern day Iraq. The Sumerian cylindrical seals were usually created of stones (sometimes semiprecious stones) of different types. The ancients utilized amethyst, obsidian, hematite among other elements. However, experts note that other materials such as glass, ceramics, gold, silver, wood, bone and ivory were also used in ancient times to produce these objects. Apart of being considered symbols of status and amulets, ancient Sumerian cylindrical seals also had other practical uses. They were used to sign documents written on clay tablets. By using a stamp to make an impression on the surface of a fresh clay tablet, an individual could certify that the document was genuine. This need to authenticate the documents occurred with the increase of bureaucracy that took place in Mesopotamia, especially in the southern parts, where it was more complex, throughout the IV millennium BC. In business and commerce, cylindrical seals were used to certify that stored goods were not tampered with or stolen. In this way, we find impressions made by cylindrical seals on clay used to seal storage jars and on doors of warehouses in ancient Sumer. The design of the Sumerian cylindrical seals has always aroused great interest among experts, mostly because of the intricate carvings covering very diverse subjects. As noted by experts, the motifs were usually focused on three main motifs: combat, banquets and religious themes. On their surface, we can see deities, human beings, plants, animals and religious iconography. Among other designs that can be observed on the cylindrical seals are geometric patterns and inscriptions in cuneiform script. THE URUK-STYLE SEALS SHOW ANIMALS AND FIGURES DEPICTED IN AN EXCEPTIONALLY NATURALISTIC FASHION, SUGGESTING THAT THE SEAL CARVERS WERE AIMING FOR EXPRESSIVE CLARITY. THE MOTIFS INCLUDE RITUAL NARRATIVES INVOLVING TEMPLES, BOATS AND OFFERINGS TO GODS, AS WELL AS DEPICTIONS OF THE NATURAL WORLD IN HIERARCHICAL ARRANGEMENTS. THEY ARE SKILLFULLY CUT, DETAILED, AND THEIR COMPOSITION TENDS TO BE BALANCED AND AESTHETICALLY PLEASING. THE JEMDET NASR-STYLE SEALS ARE LESS DETAILED THAN URUK-STYLE SEALS AND ARE CHARACTERIZED BY THE HEAVY USE OF DRILLS AND CUTTING DISCS, WHICH PRODUCE ROUND AND LINEAR MARKS RESPECTIVELY. COMMON MOTIFS FROM THE JEMDET NASR-STYLE INCLUDE WOMEN WITH PIGTAILS INVOLVED IN DOMESTIC LABOR AND HERDS OF ANIMALS IN FRONT OF TEMPLES (4). If we take a look at the archaeological record we will find that archaeologists have discovered as many cylindrical seals as clay tablets on which they were printed. There are numerous cylindrical seals in museums around the world. The Baghdad Museum, for example, has a collection of 7,000 cylindrical seals, although most of them were looted when Baghdad fell into the hands of US troops in 2003. These valuable archeological pieces have not yet been recovered.